Welcome to the Java 9 Master course. whether you've programmed before or never had programming experience, by the end of this series you'll be able to write sophisticated real world java applications. 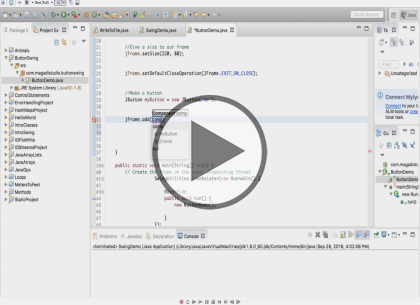 This course covers how to start using the graphical user interface in java. it covers Swing and proceeds to use Swing to make a flashcard Application to show all the features. This course is for beginners and programmers with experience alike.